By default Tableau gives you some options to decide when to show the mark label: All, Min/Max, Selected, Highlighted or Line Ends (for the line chart). What if you want to have different options, such as "Max & Line Start" or "Min & Line Ends"? You can also mix those conditions. You can also use that logic to color your chart. Just need to change the calculation to boolean. Visit my personal blog Data Visualization & Preparation tips.  Why to use the Aggregation option? If you decide to extract the data instead of use live connection, there is an important option, called Aggregation, which can save disk space, reduce extract time and improve your visualization performance. When you use Aggregation option, you are telling Tableau to perform an aggregated extract, which means that all the measures will be summarized (avg, min, max, depending of what you choose as default aggregation) by the visibles dimensions. We will extract the below table (sales table), which has 31 records and 2 fields: Employee and Sales. Each employee may have more than one record. Our extract will need both fields, and we will perform the extract with and without the aggregation option. #1 - Not using the aggregation option. The process extracted 31 rows (all the table rows). The process extracted only 16 rows. In that example we used a small table with only 31 records. Probably, in the real world, your tables may have millions or even billions of rows. If that is your case, you should consider to use that option. But be aware: when you aggregate your measures, you will not be able to create calculations in the most granular level of data anymore. In other words, your row level calculation will be different. [Sales]/[Profit] and SUM([Sales])/SUM([Profit]) - which will give you different results. When you use an aggregated extract, you will no longer have the granular data, so didactically, you will no longer be able to perfom [Sales]/[Profit], just SUM([Sales])/SUM([Profit]). For more information visit KB Aggregated Extracts. Also, visit my personal blog Data Visualization & Preparation tips. In the post LOD Expressions #1 - Over (partition by) x LOD we talked a little bit about LOD Expression and how it compares to over (partition by...). As we said in that post, LOD expressions allows you to achieve similar results than over (partition by...). Now we are going to understand the reason why we said "similar". In other words, we will understand the difference between them. We will use a pretty simple example to make easier to understand. Many of you might say this simple example can be solved with table calculation and/or data blending (as we did in the post Compare a filtered dimension to all values). And you are right, you can re-build this example with those approaches, but the intention here it to explain what happens in the back-end when you use LOD, so you can can apply on more complex cases. We want to compare the sum of sales per employee with the sum of sales of the region. As you can see, they have different technical solution. 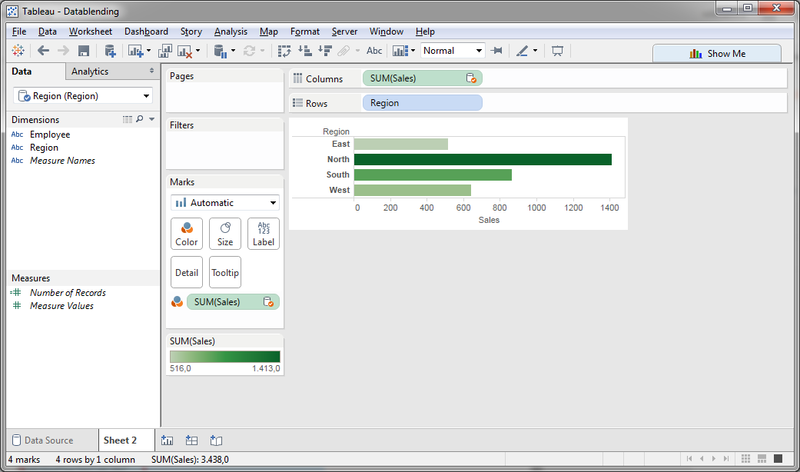 With Tableau's approach you can interact direct with those sub-queries, which gives you some advantages. 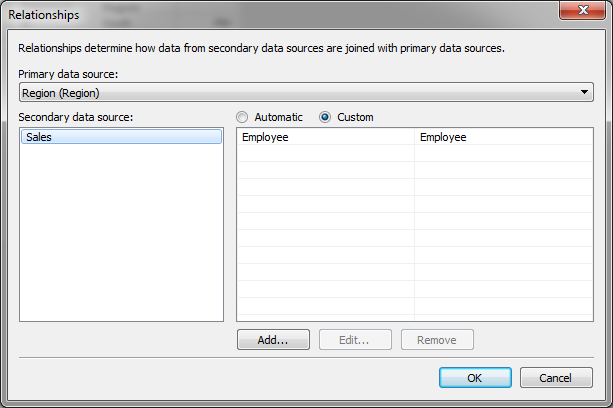 For example, you want to exclude the Employee A from your analysis. To do that, you will use a quick filter. When you add a filter, you can whether or not use it as a context filter. Depending on which option you chose, you will interact with specifics sub-queries. If you did not add the filter to context, Tableau will exclude Employee A from your output, but will keep it on the calculation of the Region. Which means that Employee A will still be part of the "Sum os Sales by Region". As you can see, the filter was not included in sub-query "t2", because that is the sub-query which generate the sales by region. If you add the filter to context, Tableau will include the filter "Employee <> 'A'" to your whole analysis, by doing that, the sales by region will no longer include the sales of Employee A. Now, all the sub-queries have the filter "Employee <> 'A'". What happens when you blend a local file with your database? + You will need to have both data at the same granular level of the relationship (at least). + Both data must to be in the same environment to perform the data blending. It means that even if your viz shows a consolidated information, you may be blending detailed data. For example, you have a sales table (database) and a region information (excel file). You want to summarize the sales per region, so you have to blend both datasources by employee. So, you drag & drop [Region] (from your local file) to Rows shelf, and [Sales] (from your database table) to Columns shelf. At this point, you are asking Tableau to retrieve two fields from your database: employee and sales. + Both data must to be in the same environment to perform the blend. Now, Imagine if you have a table with millions of rows and you want to blend with your local file to see the sales by region. You will have to retrieve millions of rows from your database, move them to your computer and blend them with your local file. If that is your case, be careful. If you are a SAS user, that will be the same behavior when you join a dataset (.sas7bdat) with a table in a database. Let's imagine you own a company. In your company, you have many sales person, and each sales person may (or may not) be the boss of other sales person. A boss can have other boss, and so on. Anyone of your company can sell: a sales person, the boss or even the boss's boss. You want to analyze the sales per sales person. Not only the individual sales, but include the sales of the hierarchy. E.g: B is the boss of F, and F is the boss of P.
When you see P sales, you want to have only the sales of P, because P is not a boss. Which indicate who is boss of who. How do you achieve your desired output with those tables? You will need to use recursion in your database. What does that means? Well, that means you need to create a recursive view in your database, which will have a loop inside. 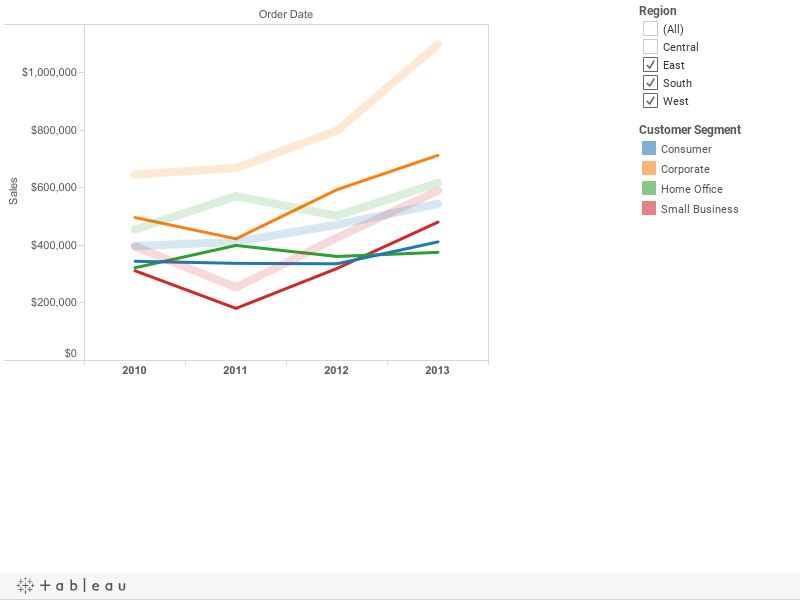 And then you can use Tableau (connected to your recursive view) to helps you to create wonderful visualizations. You can use this approach in many databases (Teradata, IBM DB2, etc...). In this example, we will use Teradata sintax. But, attention: to use the recursive view, you must to have a breakpoint, otherwise your view will perform an infinity loop. In this case, the loop stops when boss.boss = boss.employee. Connect to your database and join your view (boss_view) and your sales table, using employee. + Who is my best seller? Employee "F" appears in Seller A and B, because F belongs to B, and B belongs to A. Also, the Seller includes it self. You can note that for the Seller B, it also shows B as employee. As most of you know, Row Grand Totals allows us to see the Average, Sum, Minimum and Maximum by row. But, what happens when we want to see the difference between two periods? For example, you want to compare the Sales of 2013 x 2012 (or any other year). It seemed so easy to do... so I started to try to build the red column with Tableau. After a couple hours, I did not find any solution to achieve that output. Even the famous table calculations (like "Difference") did not fit my requeriments. So, I went to the Community Forums to looking for a solution. What a found (I hope I did not miss any simpler solution) were many ways to achieve those values, but not the layout that I wanted. By the way, I suggest you to see this thread (which received many posts with different solutions) How to hide blank columns created by table calculations. Should I give up and use the workarounds or maybe change the layout to fit the solutions I found? No! There is always a way (or almost always). After a while....That's it! .. much simpler than I imagined. If you are familiar with SQL and had to solve complex analysis with a single query, you've probably used the OLAP function "OVER (PARTITION BY)". Basically, this function allows you to perform an aggregation in a different level of the view. You might use role playing table, sub-queries or any other way that allows you to create the desired output. But, if you want something easier and simpler to understand? In that case you may be looking for OLAP functions. By adding "over (partition by <field 1>, <field 2>,...<field N>)" you can choose the fields used to aggregate. In this query you are telling the database that for the second aggregation "sum(Sales) over (partition by Category)", you want to sum the Sales by Category. Before Tableau 9, to achieve that result you would have to use joins, data blending, sets or maybe table calculations (Compare a filtered dimension to all values), but all these require much more work and they have their limitation. In Tableau 9, the new capability Level of Detail Expression (LOD Expressions), allows you to perform calculations which can gives you similar results than "over (partition by...)" - and much more! You can also use quick filter in or not in context (see attached Tableau 9 workbook). The intention of this post is not to explain how the calculations works. How to compare a Region sales to the overall sales? 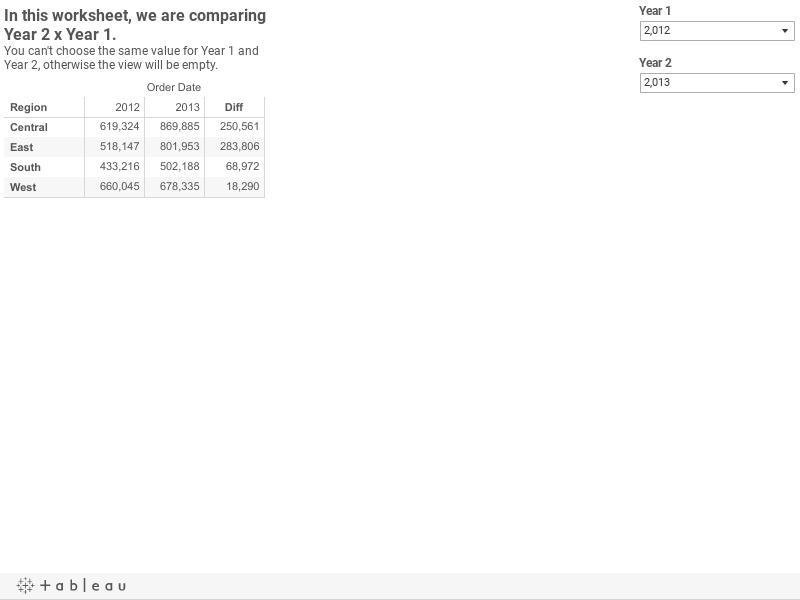 Situation: You want to have a line chart which you can choose one Region and compare to the sum of all regions, across year and customer segment. How do you achieve the desired result? I guess there are a lot of ways to do that, but today we are going to use the duplicate datasource approach. In the follow example, we are going to use Superstore data set. In our case, we want to see a line per customer segment across the year, filtering a region (on the primary datasource) and comparing to overall regions. So, we will blend by Order Date and Customer Segment. We are almost done. Now we will create our viz. Now we will include the overall Sales per Customer Segment per Year. 7.a Change the secondary Sales to Dual Axis and then Synchronize the Axis. 7.d remove "Measuare Names" from Color. Now you can filter any field from the primary datasource and compare to the overall. In other words, how to simulate the date_part 'semester' in the DATEDIFF() function. There are many ways to reach that. In this blog, I'll explain 2 of them. + get the int part of the division. 1. 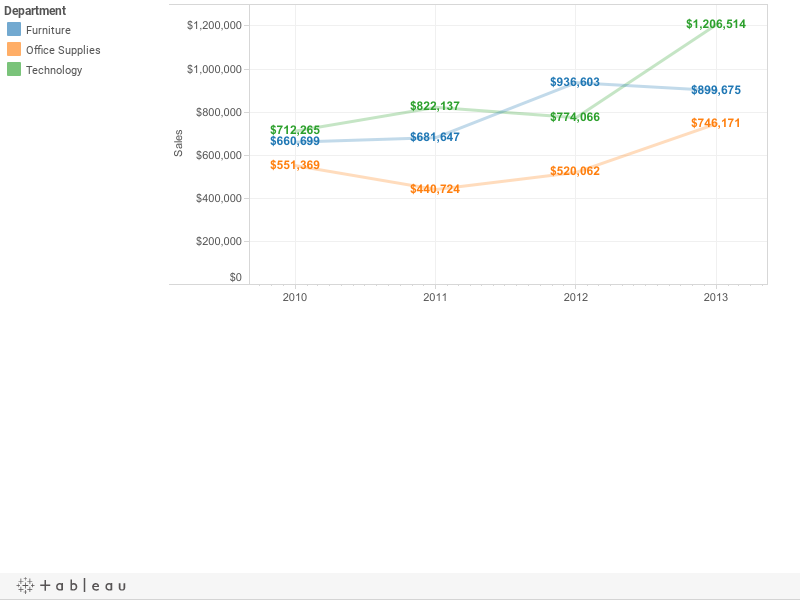 Create a line chart, and set the color line. 2. Duplicate the row measure. 3. For the second axis, change the mark to 'text'.